Chicken Pot Pie | Chrissie Cooks?! Is there anything more comforting than a Chicken Pot Pie? It turns out, yes, yes there is: four chicken pot pies! This recipe is a beast. The original recipe claims it makes three pies. My best friend uses the same recipe and routinely gets 5 or 6 pies out of it. I always get a solid four. Maybe it has to do with the pan size and/or the amount of filling per pie, or maybe there’s some Sisterhood of the Traveling Pies magic going on here… hard to say. Either way, you can count on your freezer being fully stocked after making this. Here’s the thing, though. It’s kind of a commitment. It takes two to three hours, all in. Your feet will hurt. Your back will hurt. But your house will smell heavenly, and your husband will do the dishes for you because he’s going to be so grateful for the Chicken Pot Pie about to be stuffed in his piehole (see what I did there?). You chop a LOT of veggies. You will feel like you’ve been chopping for your entire life. Your hand will cramp. Your eyes will be watery (from the onions and from the sheer exhaustion). And you will have a mound o’ veggies to show for it. You boil and shred some chicken. A LOT of chicken (sensing a common theme with this recipe?). But here’s the good news: you’re about to learn a new trick. Don’t shred your chicken with two forks like some kinda chump (unless you want cramped claw hands for the rest of the day). 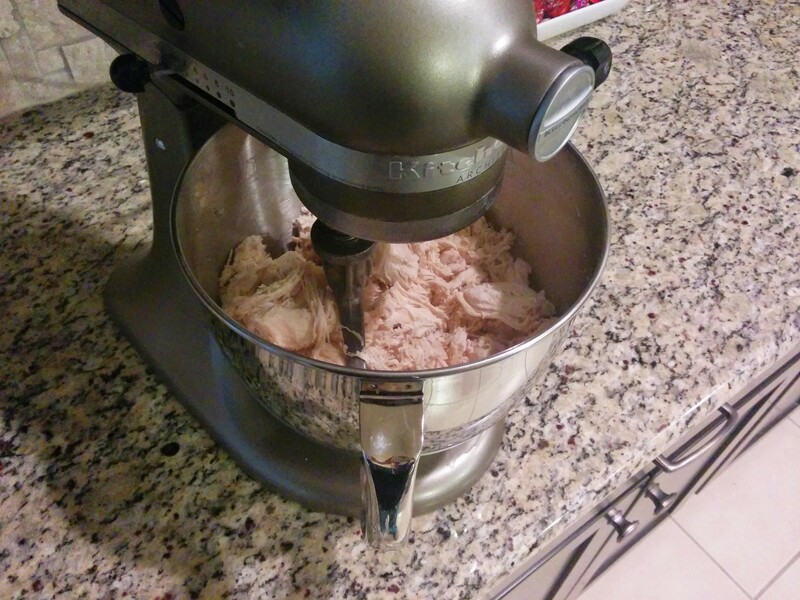 Just drop that cooked chicken in your stand mixer with the paddle attachment, and run it on low for 30 seconds to a minute. And then watch with amazement when your chicken is shredded to perfection with zero effort. And now the fun part – assembly! Line your foil pie pans with crust, drop in some filling (I usually mound it very slightly in the middle so it’s not totally flat), then top with another crust. Smoosh the crust edges together with your fingers or a fork, poke some holes for venting, and repeat, until you’re out of filling. Wrap up the ones you’re freezing nice and tight, label them, and stick them straight in the freezer before temptation overcomes you and end up eating the raw dough and filling. Assuming you’re making one of them right away (because what kind of superhuman could do all that work and not get any instant gratification? ), put that one in the oven at 350 F for 45-50 minutes. And then collapse on the couch until it’s ready and make your husband get up and get it out for you because you’re exhausted and you’ve earned it. Put chicken breasts in a large pot and fill with water until chicken is just covered. Bring to a boil for about 20 minutes, or until chicken is cooked through. Set aside. 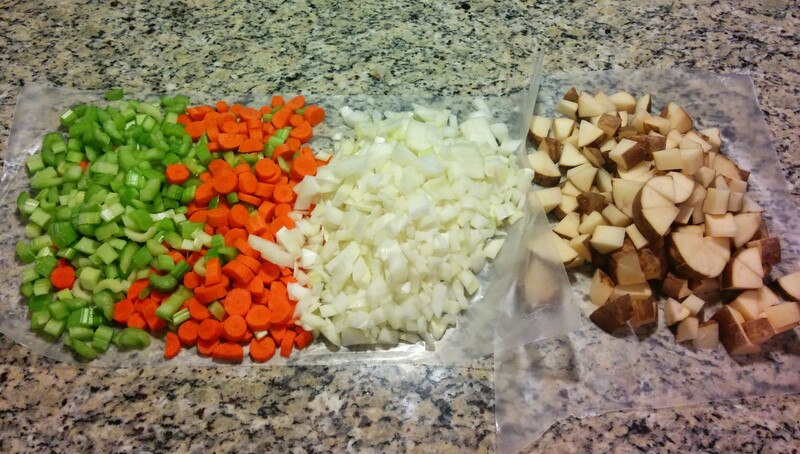 Meanwhile, chop the onions, carrots, celery, and potatoes. Melt butter in a large stock pot, add the onions, carrots, and celery, and sautè for 5-10 minutes, until onions start to get translucent. While veggies are cooking, shred the chicken, either in a stand mixer or with two forks. Set aside. 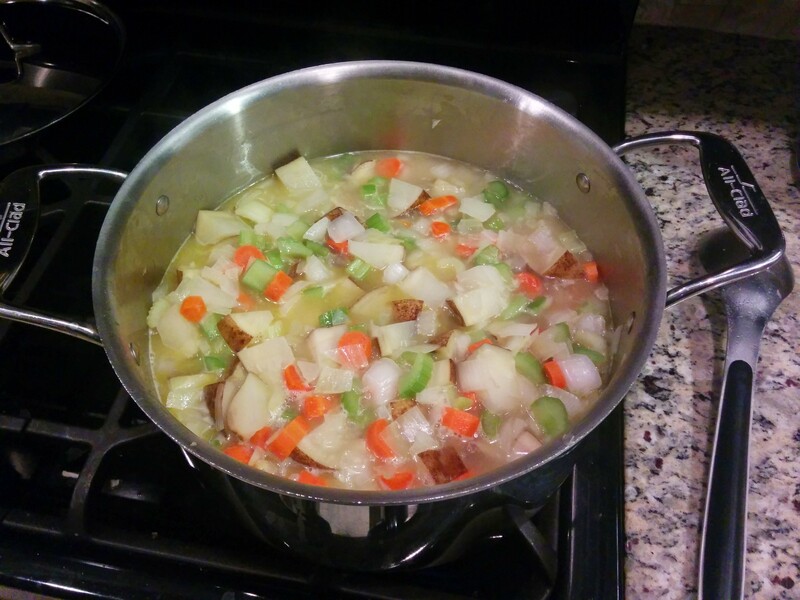 Add chicken broth and potatoes to the stock pot, and simmer over medium high heat, until broth has reduced by half (20-25 minutes, usually). 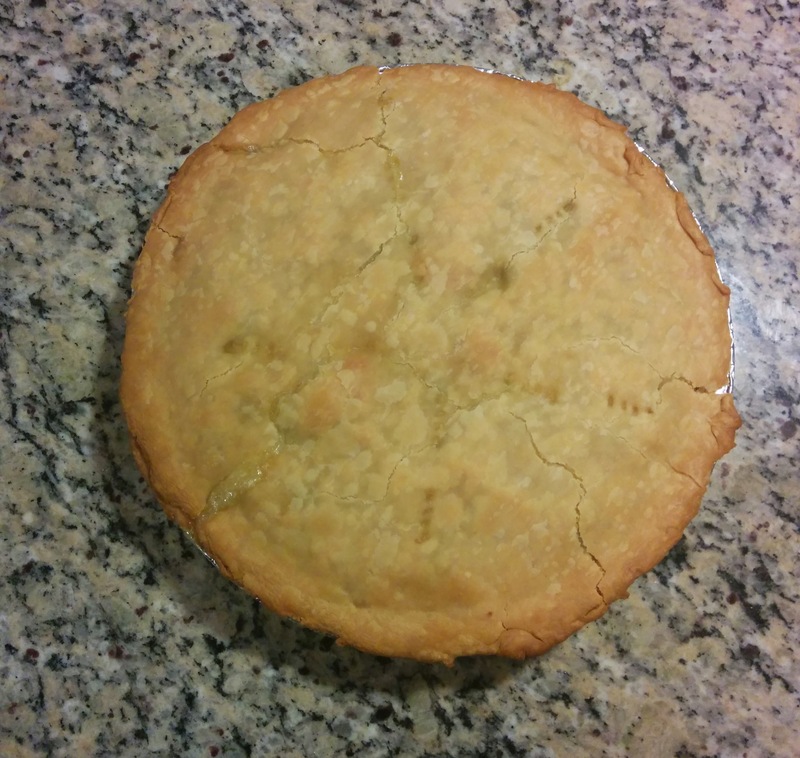 Remove pie crusts from the fridge to soften for 10 minutes. 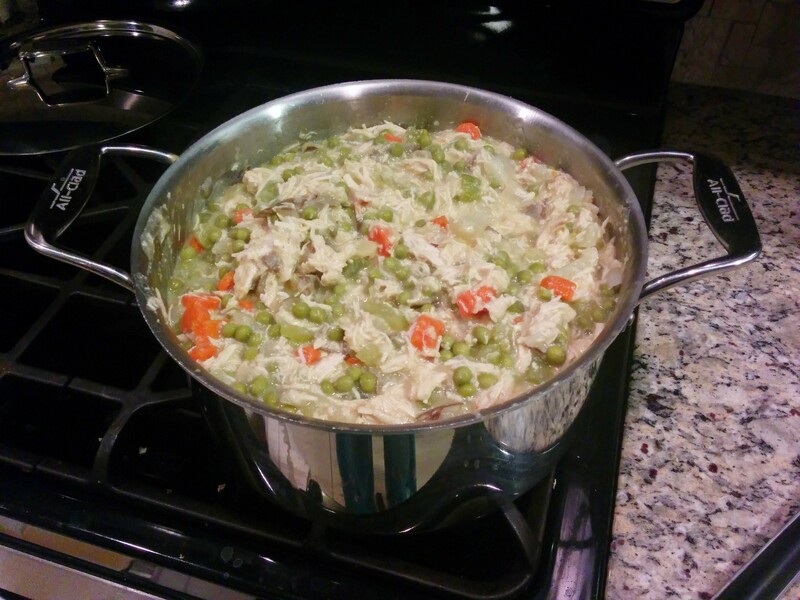 Pre-heat your oven to 350 F.
Stir in shredded chicken, green peas, and cream of chicken soups into the stock pot, and turn heat down to medium low. Mix together really well, and let it blend together for a couple minutes. Add salt and pepper as needed. Line 9″ foil pie pans with bottom crusts, and evenly distribute chicken filling so each pie is filled and slightly mounded in the center. 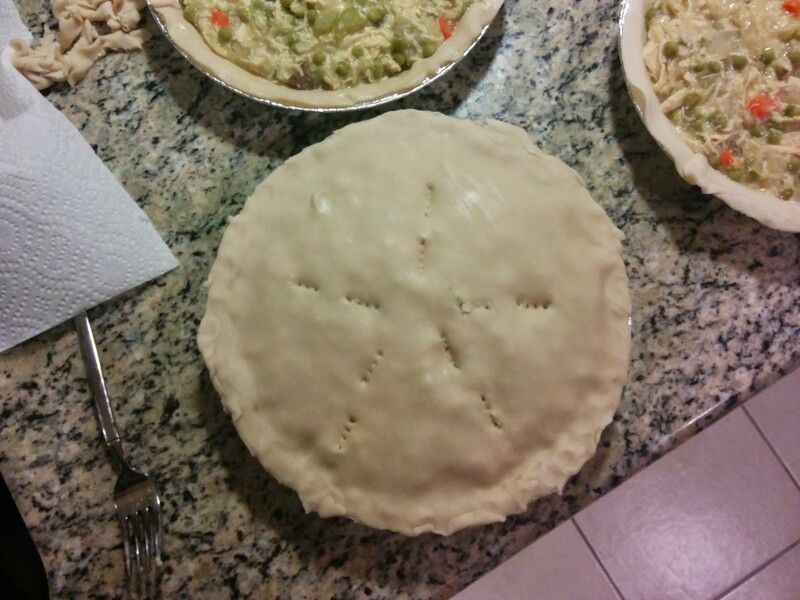 Place remaining crusts over the filling, and pinch the edges together with your fingers or a fork. Poke a few holes in the top to ventilate using a knife or fork. Bake for 45-50 minutes, or until golden brown and bubbly. Keep an eye on the crust, and cover with foil if it starts to brown too quickly. Let sit for 5 minutes before cutting. Wrap the ones you’re freezing really well (2-3 layers of saran wrap), and label with date, oven temp, cooking time, and put them directly in the freezer.